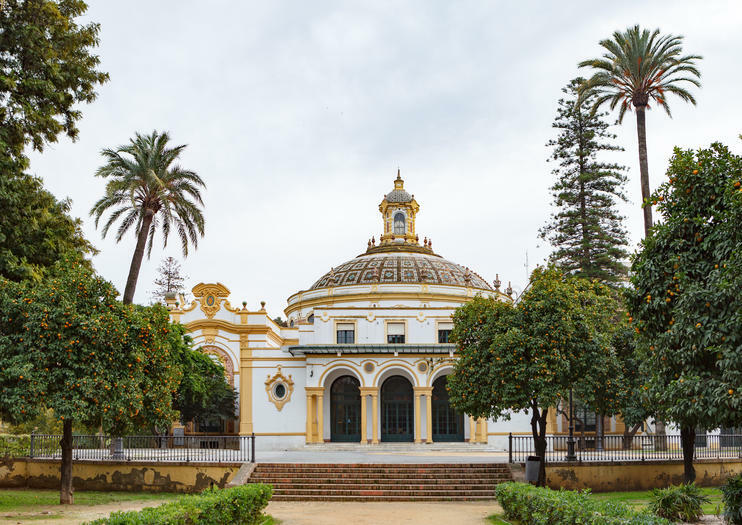 A beautiful Spanish square surrounded by palm trees and classic architecture, the Plaza de América is one of Seville’s most beautiful open air plazas. It was first constructed for the 1929 Ibero-American Exposition and is today lined with several of the city’s top museums. The three palaces, each with a different architectural style, are worth seeing for their facades alone. The plaza is a place to take a leisurely stroll or sit on a bench and admire the surroundings, but most will want to visit one or all of the excellent museums. The Royal Pavilion is a beautiful Neo-Gothic structure, while the Museum of Popular Arts showcases Neomudéjar style and the Archaeological Museum was built in Neo-Renaissance style. Other highlights include two large roundabouts, colorful tile work throughout, and the famous white pigeons that can only be found in this part of the city. The plaza is often included in walking tours of Seville. The plaza is located in the Parque de María Luisa, to the south of the park’s entrance. It is open during daylight hours and is free to access.